Nickos A. Poulianos was born in Tashkent (Uzbekistan), July 15 th 1956. He was educated in Russia, New York, Greece, and Italy. He graduated in Biology at Rome University “La Sapienza” in 1984, and went on to a complete PhD in Anthropological Sciences concerning the ‘ Petralona Man’ at the Florence Institute of Anthropology in 1989, with a scholarship of Alexander Onassis Foundation. From 1985 to 1986, Dr Poulianos received a scholarship from the Greek Ministry of Education for a one-year study stay at the Geological Institute of the Academy of Science in Prague, which was followed by further studies and research concluding with a second PhD thesis on Petralona Vertebrate Palaeontology in 1998. 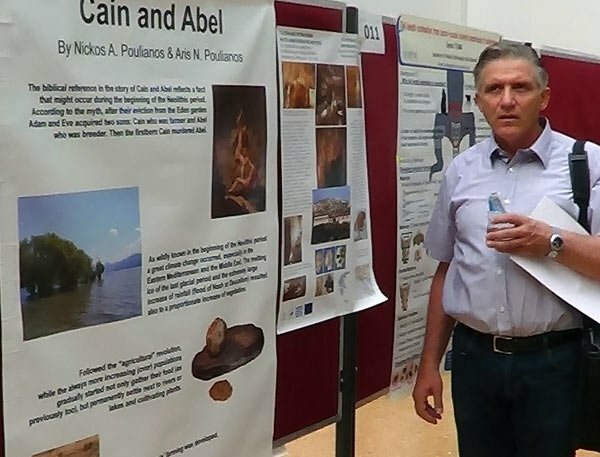 Since 1986, Dr Poulianos was assumed by the Greek Ministry of Culture in the Ephorate (Department) of Palaeoanthropology-Spelaeology, working in various Greek sites (Kassos - Dodecanesse, Kilkis, Cyclades, Lesbos, N. Sporades, Mani, Ptolemais, Chalkidiki etc). He became a founding member of the European Anthropological Association in 1977 and during 1990-1992 was elected its local treasurer for Greece. He has been a member of the International Union of Anthropological and Ethnological Sciences since 1980, member of the American Association of Physical Anthropology since 1990, and the New York Academy of Science since 1991. In 1996, he was elected President of the Anthropological Association of Greece, where he served until 2009. In 1990 his biography was included in the edition of “Who’s Who in the World”, as well as in 2000 at that of the International Biographic Center – Cambridge. From 2002 to 2006, he was teaching students of archaeology at the University of the Aegean, Department of Mediterranean Studies-Rhodes. In 2006-2008, he was elected at the Council of the European Anthropological Association, and since 2010 serves as treasurer of the board. The prehistoric site of Petralona cave excavations has occupied his primary scientific interest, where initially specialisation and afterwards scientific contribution took place during 1974-2014, by participating in all stages of the cave excavation, presentation of its findings in the adjacent Anthropological Museum and scientific contributions on the topic. Dr Poulianos has more than 100 publications in national and international scientific journals and meetings, in English, Italian and Greek languages, relating to the ‘ Petralona Man ’.